As humans, we all want to look our best. For hundreds of years we have strived to be fitter, slimmer, bigger, healthier. With this has come many a fitness and diet fad. Here we will look at some of the craziest over the past few centuries - which we definitely don't recommend doing! Back when corsets were the rage and big fluffy skirts could be seen on every well-to-do woman, starving oneself was not an uncommon way of getting thin. Woman in the middle class would literally waste away in order to live up to the Victorian notion of frailty, which was associated with spiritual purity and femininity. Lord Byron, a poet, popularised the vinegar and water diet to “cleanse the body”. This led to vomiting and diarrhoea, which, of course, also led to weight loss. Although we all know better now, cigarettes were once hailed as appetite suppressants and used by thousands for the sole purpose of staying slim. Wash that fat way with the slimming soaps of the 1930s! Said to tone, firm and “de-fat”, these soaps supposedly helped people get thin quick. But we know better – they were just normal soaps with pretty packaging. The act of cleaning itself would burn more calories! Originally designed to replace a masseuse, the vibrating belt machine evolved into a fitness fad that claimed to provide 3,200 jiggles per minute. At least it feels good? We all know that sleeping is good for us, but can it shed the kilos? For some, including celebrity Elvis, catching some z’s was a diet in itself, with followers sedating themselves in order to sleep for days at a time in a bid to lose weight. The 70s were all about the growth of technology, including new ways to get slim. One of these was the trim jeans – advertised as the “Amazing Space Age Slenderiser”. 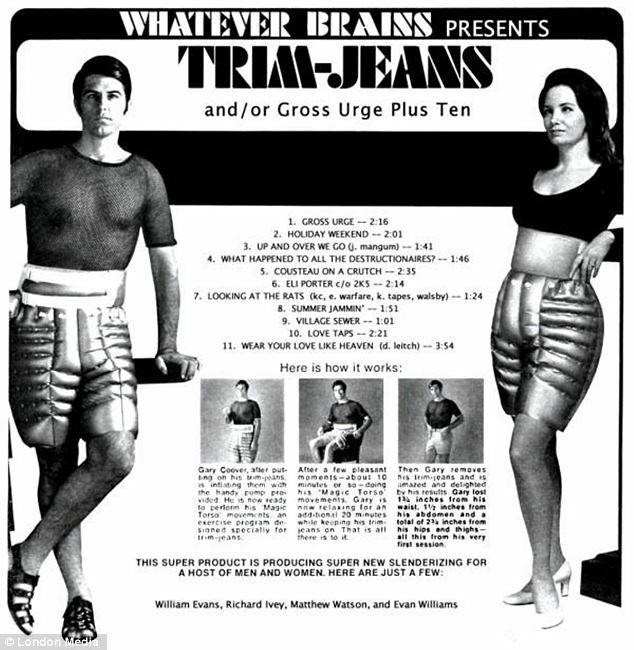 The inflatable jeans were meant to be worn while acting out a set of “Magic Torso” exercises. Spruiked by “As Seen On TV” face of the 80s Suzanne Somers, this device claimed to help your legs get toned and trim in no time. But not only was all that squeezing kind of exhausting, it also looked a little… funny. This show full of scantily clad women moving into provocative poses stirred a lot of confusing feelings for adolescent boys eating their breakfast in the 80s and 90s. Aerobics kicked off an era of leg warmers, lycra and string bikinis over tights. Another TV wonder, the Shake Weight was well known for all the wrong reasons… said to increase the efforts of exercise with its spring loaded pump action within a standard dumbbell. Despite the jokes, the exercise piece actually sold over 2 million units in its first year. One of the newest “as seen on TV” inventions, the Ab Circle is just what it says – a circular piece of exercise equipment that focuses on the abs. As far as research can show, all it really does is get you whipping your hair back n’ forth!